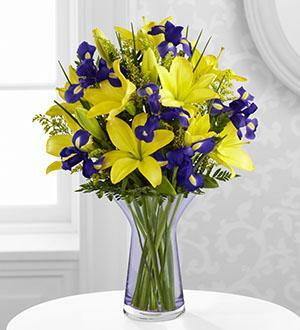 The Touch of Spring® Bouquet by FTD® blossoms with iris and Asiatic lilies to give your special recipient a cheerful display of spring beauty and sweetness. 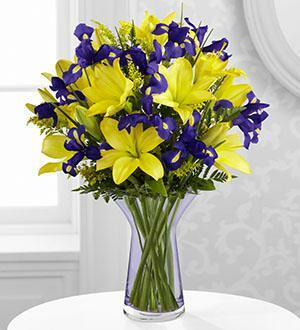 Sunlit yellow Asiatic lilies burst with charm and appeal arranged beautifully amongst purple iris, yellow solidago and lush greens to form a remarkable flower bouquet. 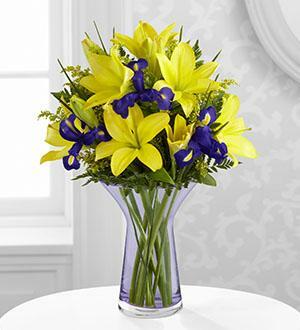 Presented in an elegant flared lavender vase, this flower arrangement expresses your warmest sentiments for spring, making it the perfect gift to celebrate Easter, to send for a graduation or to extend your thanks and gratitude. Your purchase includes a complimentary personalized gift message.